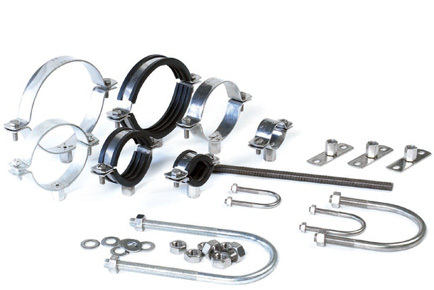 • Produced in accordance with BS1494, in Black, Galvanised or Zinc Plated finish. • To suit BS1387 steel tube in sizes 1/4” – 6” nb. • Available in Metric or BSP thread sizes where applicable. 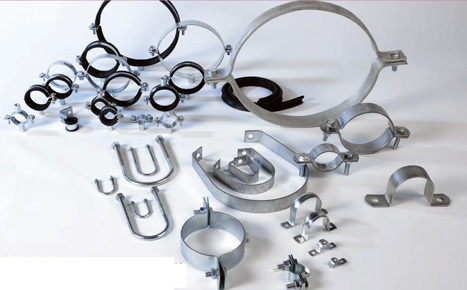 • Full range of BZP pipe clamps, with or without Rubber lining for noise insulation. • Sizes available 1/4” n.b. (12 – 14mm o.d.) – 8” n.b. (215mm – 225mm o.d.). without bosses from 1/2” n.b. – 14” n.b. with all sizes covered in between. • Grade 304 (A2) and 316 (A4) Stainless Steel available where applicable. 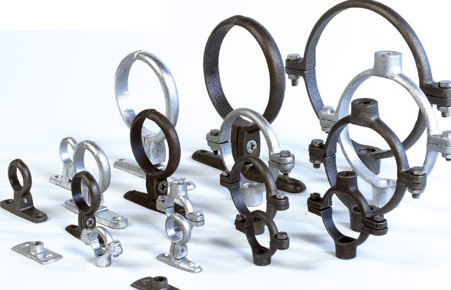 • Unlined and Rubber Lined pipe clamps available in sizes 3/8” nb – 8” nb (special size o.d.’s made to order in house). • Backplates and ancilliary products also available to compliment the range.